Duane Linklater, Id, 2016, handmade moose hide moccasins from artist, two wall components, each 48 x 5 x 24, Courtesy Catriona Jeffries. 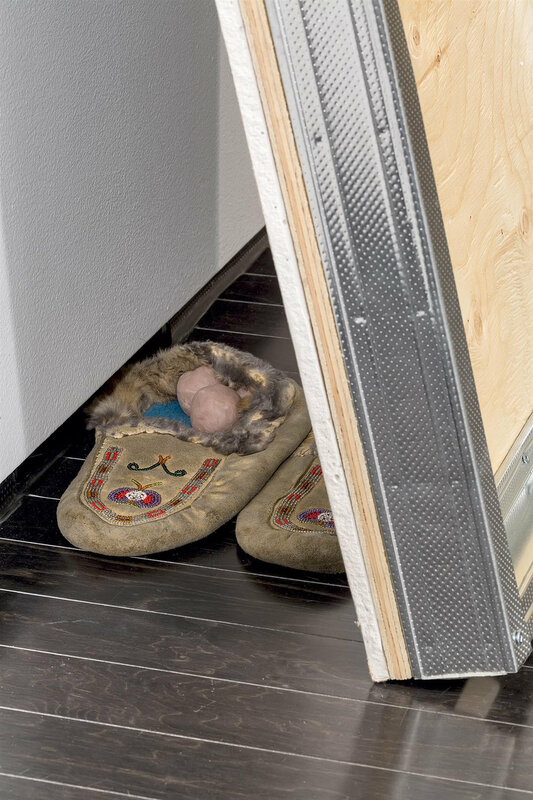 Duane Linklater, Id (detail), 2016, handmade moose hide moccasins from artist, two wall components, each 48 x 5 x 24. Courtesy Catriona Jeffries. Duane Linklater, Trap, 2016, Powder-coated trap, mirror, gypsum, wood, 9 x 33 x 24 inches. Courtesy Catriona Jeffries. An Omaskêko Cree artist, Duane Linklater addresses issues of cultural loss and recovery as well as authenticity, appropriation and authorship, working in performance, installation, film and other media. He often collaborates with others, reconsidering oral traditions where the transmission of knowledge, stories or histories is essential to future generations. Linklater’s work mobilizes present day relations of cultural heritage while highlighting traces of genealogy and questions of legacy, often inhabiting the site-specific qualities of a given exhibition space with his own displaced narratives and stories. Linklater has exhibited his work nationally and internationally including at Eli And Edythe Broad Art Museum at Michigan State University, Lansing, MI (2017), 80 WSE Gallery in New York City (2017), the Art Gallery of Ontario in Toronto (2015), Vancouver Art Gallery (2015), Institute of Contemporary Arts Philadelphia (2015), the Utah Museum of Fine Arts in Salt Lake City (2015), the SeMa Biennale in Seoul Korea (2016), and Documenta 13 (2012) to name a few. Linklater has also received several prizes including the 2013 Sobey Art Award, a national annual prize given to an artist under 40 and more recently the Victor Martyn Lynch-Staunton Award from the Canada Council for the Arts in 2016. Born in Moose Factory, Ontario Canada, Linklater now lives in North Bay, Ontario. Linklater’s recent sculptures, Trap (2106) and Id (2016) will occupy the Storehouse venue at the English Camp.